Fear. It’s a part of daily life. Everyone has fears. 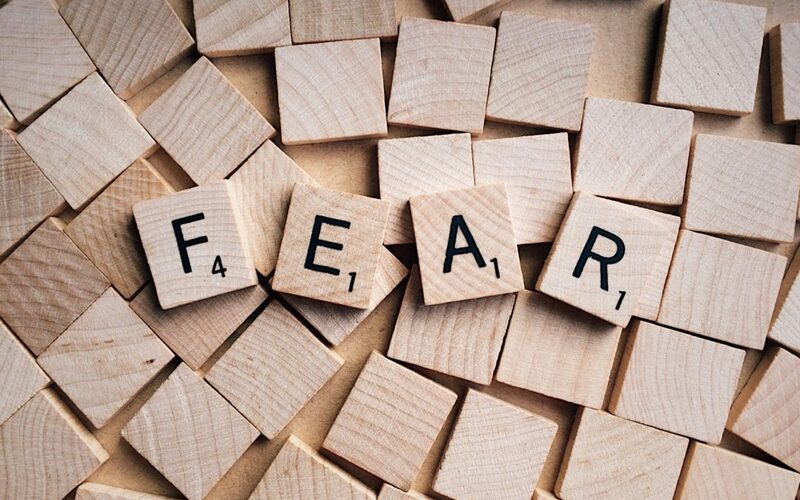 And there are a seemingly infinite variety of fears, whether it’s a fear of doing something new, fear about what other people think, fear of losing a job, fear that our kids won’t grow up to be better off than us, fears about our health….and an ocean of additional fearful thoughts that people have every day. Re-reading the last part of the last sentence in the above paragraph again will give us a clue. …an ocean of additional fearful THOUGHTS. This is a key to fears. They are thoughts. How many thoughts do you have in any given day? According to the National Science Foundation, the average person has about 50,000 thoughts per day. That holds the potential for a lot of fearful thinking going on! Most people know that they shouldn’t listen to their fearful thoughts, but the big question is, how does one stop these fearful thoughts? To grasp how to move beyond fears, we need to first understand how fears come about in the first place. Secondly, our mind is a data filtering tool that labels, organizes, and otherwise makes sense of what the body is receiving as data. Put another way, the mind characterizes the incoming energies we sense with our body. How the mind does this is based on our past experience. This is a key: The mind works based on our past, and what we’ve been focusing our energy on determines how the mind processes the incoming data. Any data that the mind doesn’t know what to do with is either ignored, labeled as false, or is lumped in with what the mind determines to be past data that is similar. Thirdly, the human being, overall, is designed to create. The being takes all the incoming sensory data and information and uses it to create. Creating has nothing to do with the past, except to utilize components of the past, combined with current incoming sensory data, to create something new. Creation, for which we are designed, is concerned with, and focused on, the now and the new…not the past. So…how do we go from having fearful thoughts to thinking, feeling, and being more confident? The mind filters all current incoming data based upon programming from what we’ve been focusing on. And, left without supervision, the mind will continue circling in the past forever. We break the mind out of its “rut” by utilizing the tool of focus. This is a key. How we program, or “tune,” the mind, is by what we focus our awareness on. Consciously changing what we focus on changes the mind’s programming, and changes our thoughts and how the data coming in from the body is filtered, sorted, and labeled. As we change our focus, our filters get adjusted in the mind accordingly. How the data is selected, processed, and labeled changes, resulting in a shift in our thoughts about our experience. By using our power of focus, we are therefore much more in control of our mind, and what thoughts we have, than we realize. Our mind is a tool for us to use. This is worth repeating: Our mind is a tool for us to use. To shift from fearful thoughts to confident thoughts and beliefs, it is necessary for us to begin consciously using our mind as the tool it was designed to be for us…instead of allowing the mind to use us. We have power over how we program our mind, and while reprogramming the mind takes effort, it is doable, as every happy, successful, and confident person will attest to. What we think and believe ultimately determines what data is allowed into our awareness and how we characterize what we sense into thoughts. Going a step deeper, what we choose to consciously focus on creates the filters that create our thoughts and beliefs – what our experience is, and how our experience gets labeled and organized. Recognizing that our mind is based in the past, while we are meant to be in the now, creating for the future, we can see how, without consciously applied effort, our mind can keep us surrounded in limiting thoughts, beliefs, and fears. If you’re experiencing fears that you feel unable to move beyond, I invite you to contact Body Wisdom for a complimentary consultation regarding releasing the underlying thought process(es) that are entrapping you and keeping you from moving forward in your life in a confident way.